One of my favorite duties as a veterinarian is performing puppy examinations. I love to play with the puppy and feed them treats, especially during vaccinations. 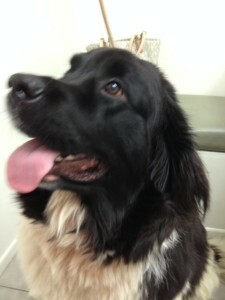 I try to make it a good experience to prevent a long term fear of veterinarians. Part of the exam includes a careful auscultation of the chest to listen for heart problems. Newfoundland dogs are prone to a heart condition that causes a murmur. Name the condition. Subvalvular aortic stenosis (SAS) is an inherited condition of Newfoundland dogs caused by a genetic mutation. Dogs with SAS develop a ring of thickened tissue right below the aortic valve that impedes blood flow out of the heart into the aorta. When I listen with my stethoscope to dogs with SAS I hear a murmur on the left side of their chest. Typically, the murmur is softer in the beginning and gets louder as the puppy grows. These dogs often show signs of heart failure characterized by fainting, lack of energy, collapse and death. Dr. Joshua Stern, leader of the team of researchers at the University of California, College of Veterinary Medicine who identified the mutation hopes breeders will use this information to ‘breed’ the condition out of Newfoundland dogs. Source: -Preidt, Robert. Mutant Gene Spurs Dangerous Heart Condition in Newfoundland Dogs: Ridge of abnormal tissue forms below the aorta, restricts blood flow ad can cause sudden death. HealthDay, August 8, 2014.